This recipe came from my Mom, who found it in a church cookbook that she has kept for many years. 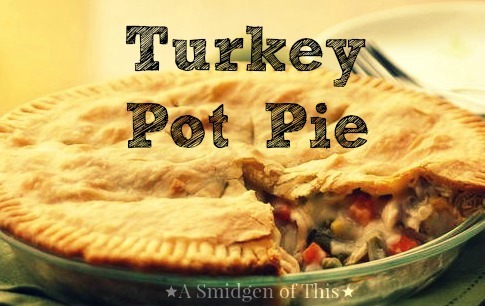 This is a great way to use leftover turkey from our Thanksgiving meal. Tried this recipe with our leftover turkey. We loved it! I did add a cup of frozen english peas just before covering with the top crust and putting in the oven. Somehow it didn’t seem like pot pie without peas! Great recipe Vicki, thank you. Thank you for commenting and so happy that you loved the recipe. And adding peas is a great idea…Next time I make this, I’ll have to do that and I’m sure my husband and son will love it!